Remember how hard it was to put on your first bra the first time you wore it? Well lacing yourself up into a corset is no harder and with practice, you will get better and quicker at doing it. To help all those kigurumi performers out there, cosplay wearers and those who want to begin corset training, I've put together a simple step by step guide to help you with putting on your corset. 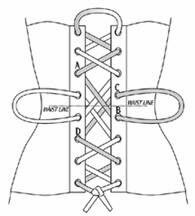 Before you put on your corset, loosen the laces so that you can put it on comfortably. Do not loosen the laces excessively as they will tangle and make it more difficult to tighten. A good rule of thumb is to loosen the corset to your natural waist size, i.e. my waist is 34", so I will loosen my corset to 34". The middle loops are called "pull loops"
Wrap the corset around you making sure it's fitting in the right places and fasten the front busk starting from top to bottom. Once the busk is fastened, just make sure the corset isn't pinching anywhere and that it's resting comfortably on your figure. You might have to shift it around slightly to adjust it. With your other thumb, hook it onto the second set of laces from the top and pull. See how I've taken the slack out of the first set of laces? 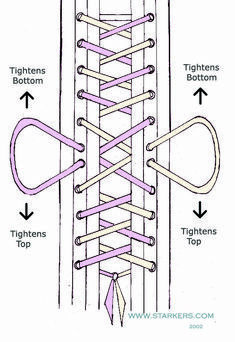 Now continue doing this with each set of laces working your way down to your waist where the "pull loops" are. When you have gotten out the as much slack as you could, pull both ENTIRE "pull loops" out to nip in the waist and to remove any remaining looseness in the upper rows of lacing. Now it's time to lace the bottom half of the corset. To do this, hook your thumb onto the bottom set of lacing, pull slowly and evenly to your desired tightness. Do not let go until you start pulling the next row of lacing. Next hook your other thumb onto the next row of lacing and pull slowly and evenly until your desired size. Notice how I've pulled the slack from the bottom row of lacing. Keep this up with each row of lacing, working your way up to the waist, each time alternating with each arm. When you reach the waist, to remove any excess slack from the bottom rows of lacing, pull the BOTTOM half of the "pull loops" and the pull both loops together all the way to nip in the waist and to remove any remaining looseness in the lacing. Then cross the "pull loops" over each other while at the same time pulling them. This will give you strong leverage to really bring in your waist. The final product! The corset is securely tied at the front and the corset placed properly on the body. The back of the corset have even lacing, with no slack. Nice post! A few other tips I have picked up are to always loosen the corset laces before removing it (don't just snap it off) and to wear it for a few hours before fully tightening it. This will keep the corset from warping, and allow it to fit your body better. Agreed on that one, this was only how to get the dang thing on right!